Dubai is becoming one of the most favourite holiday destinations in recent times. 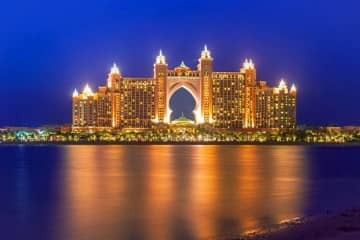 Whether you are planning a family holiday, a memorable honeymoon, your dream wedding abroad, want to renew your wedding vows, or even just a simple break from your everyday life, Dubaiholidays.co sales executives negotiate hard with suppliers to ensure your trip or Dubai holiday is a memorable experience. One can enjoy the vibrant nightlife in the top-notch bars, clubs and restaurants or a variety of adventurous sports with children. Dubai Holidays offer such a rich experience of the Arab culture in the beautiful sand dunes whilst enjoying their traditional belly dancing, food and shisha along with many more activities for adults and children. Along with many others, one of the highlights of this city is the unique design of the tall skyscrapers, which is enough on its own to mesmerise you. The tallest building in the world ‘The Burj Khalifa’ is definitely worth a visit, not only will this building amaze you from a distance but being inside is also a unique experience. Dubai has sun shine all year round and this allows you to make the most of the smooth sandy beaches. Listening to the musical waves of the sea is enough to put you into relax mode. Dubai also prides in it’s huge range of luxurious hotels and most of them are very children friendly too. Many hotels provide a range of activities for children to keep their active minds stimulated whilst the adults can book themselves in for a heavenly spa treatment. Features a 450 metre private beach, beach club and four glistening pools, complete with butler service. 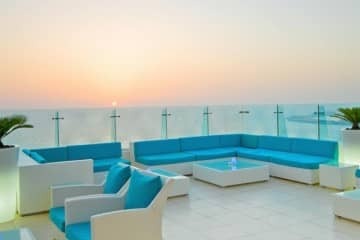 Intimate luxury hotel located in the heart of Dubai Access to Jumeirah Beach Hotel’s private beach. One complimentary entry to Wild Wadi Waterpark , enjoy the rides, the food, the drinks. Luxurious 5 star hotel, located in the heart of Dubai and close to Dubai’s International Airport. Prices are per person and prices include return Emirates flights from London Gatwick or Heathrow. Other airports and weekend departures available at a supplement and valid for travel on selected dates. 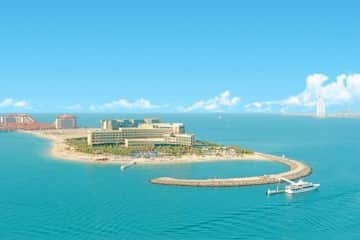 Our company name says it all; Dubaiholidays.co offer you Cheap Dubai holidays to the major gateway of the Middle East, The United Arab Emirates. We also help pre-book excursions and experiences including Dubai desert safaris in a jeep, sand skiing, dune driving, Dubai show cruises, hot air balloon ride, swimming with the dolphins, afternoon high tea at The Burj, escorted tours to Dubai and much more. Dubai Holidays offers a range of family friendly hotels and resorts to suit guests of all ages. No matter what size or the different age ranges are within a family, let alone the preferred interests and specific requirements, we provide the best services to tailor make your Dubai family holiday. Most of the hotels offer children’s clubs, baby sitting services, family interconnecting rooms and child-friendly facilities and activities. We understand that quality family time is important and therefore we do our utmost best to help create the perfect Family Holidays To Dubai experience and one to remember for sure. Dubai is one of the world’s most luxurious and dynamic city boasting a spectacular range of hotels and resorts including the iconic 7* Burj Al Arab. 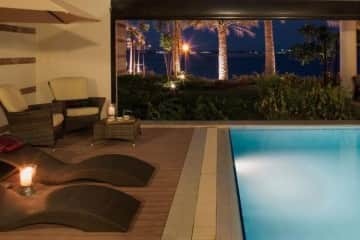 Most of these have lavish honeymoon suites, villas or premium club rooms providing extra amenities to help create an unforgettable Dubai honeymoon stay. 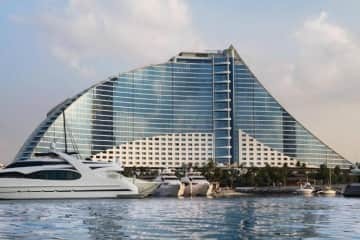 Many Dubai hotels also offer special cheap deals to Dubai exclusively for honeymooners such as complimentary room upgrade, turn down service, free fruit & wine, celebratory cakes, complimentary spa treatment and many more other romantic treats. Book your Dubai honeymoon experience with us and we shall ensure it’s a memorable start to your marriage. With an all year round splendid climate, Dubai provides a top class golfing experience in awe-inspiring Arabian surroundings. 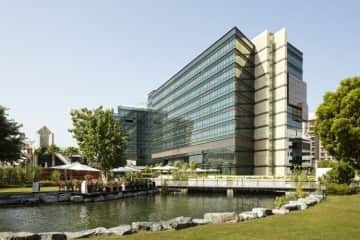 It boasts 11 championship-level golf courses including Emirates Majlis, Emirates Faldo, Montgomerie Golf Club and Dubai Creek Golf & Yacht Club. Some of these courses have been designed by the world’s leading golfers and are beautifully set within a mixture of Dubai’s manicured greens, fairways and lakes. 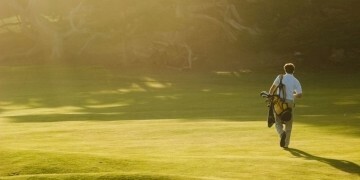 We provide a great option and quantity of Dubai golf courses for both beginners and experienced golf players. We tailor make affordable twin or multi centre holiday packages to give you more than one experience in a single trip. You can combine the Far East, Mauritius, Maldives, Seychelles, Sri Lanka & much more. To make the most of your trip, our twin or multi centre holidays are designed to provide endless opportunities with an excitement and inspirational combinations. Experience the natural beauty & culture of The United Arab Emirates with our tailor made package holidays, city breaks, honeymoon or business travel offers to Dubai & Abu Dhabi. Take the opportunity to see some of the most spectacular sights & world famous landmarks the country has to offer. We have a huge range of last minute hotel and flight deals for both leisure and business travellers. You can always enquire for Cheap Dubai Holidays deals and offers through email or call. In the past decade Dubai has become home to many notable manmade developments such as the stunning Burj Khalifa, the worlds tallest building standing at a staggering 830m from base to tip it is a site well worth seeing. Another notable development would be the Mall of the Emirates, which is the home to Dubai’s indoor skiing complex, a fun and exciting activity and refreshing break from the hot climate. The Atlantis Water Park and Dolphin Experience is also a family friendly activity, offering not only one of the highest waterslides in the world but a once in a lifetime experience to handle and swim with the beautiful dolphins who live in the resort. Although Dubai may be a city of cutting edge architectural developments and technology, the old traditions are preserved in Dubai Creek, one of the oldest parts of the city still standing, offering beautiful surroundings and serenity, and for those interested in the rich culture, The Sheikh Mohammed Centre for Cultural Understanding, is the perfect opportunity to enrich your understanding of the ancient customs of Islam and Islamic State. End the day with the Jumeirah Beach Residence Walk and Dubai Marina, which throng with exquisite architecture and incredible skyscrapers. Formula-1 The Abu Dhabi Grand Prix is a Formula One race track. It was announced in early 2007 at the Abu Dhabi F1 Festival in the United Arab Emirates. The first race took place on November 1, 2009, held at the Hermann Tilke designed Yas Marina Circuit. The Yas Marina Circuit is located on Yas Island a 2,550 hectares (25.5 km2) island on the east coast of Abu Dhabi. Dubai is a gigantic stopover center point for flights on the way to China, Japan, India, South East Asia, Australia and New Zealand as the home of Emirates, one of the world greatest carriers. Some people believes that Dubai has nothing to offer other than shopping and pools, which is a total misconception. Dubai has almost everything to offer which include water parks, river cruises, desert safaris, golf and skiing too. Their is also a myth that you cannot drink alcohol while in Dubai but most of the Hotels have licence to serve alcohol and most nightlife in Dubai is now confined to within the hotels. This incredible location in the Middle East is perfect place for stopover, city breaks and holiday for people of multiple genres and choices. 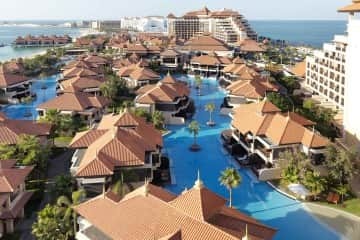 As a travel specialist for Dubai, we offer range of Dubai vacation packages, all inclusive Dubai honeymoon packages and luxury Dubai holidays deals and offers. 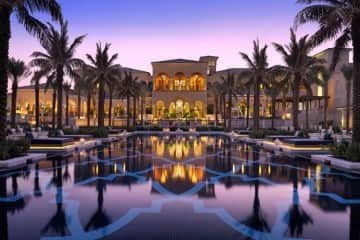 Dubai effortlessly combines traditional Middle Eastern charm with gold-star glamour. 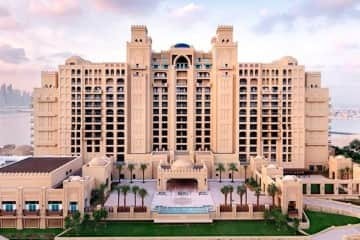 Middle East Home to the world’s biggest malls and the tallest glass building, you can be sure of world-class comforts, standards, elegance, luxury and a spectacular array of activities for a fun-packed city break. Dubai is a perfect city break destination where in few days you can experience all Dubai’s attractions.